LOCKER TRAY X - ShapeMaster Inc. This tray was designed for holding wet or muddy boots and shoes in the bottom of lockers. 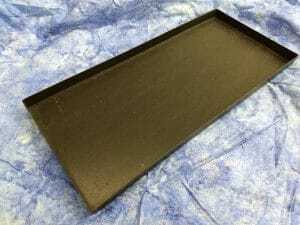 The dimensions of this tray are 21.63″ x 10 x 1 inch. This tray is available with a textured hair cell finish on the outside of the tray (helps hide fingerprints and scuffs) or nice smooth finish. The trays are smooth on the inside.